Click to Enlarge. Better, click catalog link to left to review the entire line of decorative home accents recently realized by artist Nancy Nicholson. 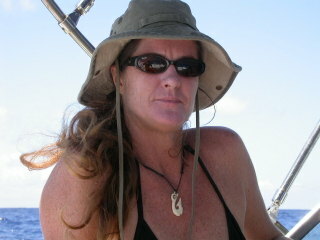 The styles, designs, and artistic development of the product is known worldwide and was recently available only in Stoneware where Nancy developed her artistic style and following after 25 years of constant and consistent hard work in Antiqua, West Indies in her studio overloking English Harbor. Taking her extraordinary artistic skills and the capability to teach into Central America she has now formed a strong team and organization of the most talented artisans in the region. Nancy has trained these former individual cottage workers into a cohesive and remarkably talented team of workers. With weeks of training and classes the stage is set to release these licensed styles and designs in decorative accents for any home of exquisite style. 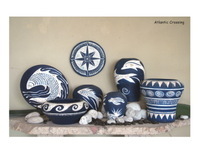 Nancy Nicholson extends a warm invitation "to the trade" of discovering an exclusive line of Ocean Inspired pottery and home accents. From the warm brown earth tones to the mossy greens and maritime blues, these objects of art will comfortably fit themselves into homes of many exquisite styles. Ranging from as large as six feet tall to a few inches high, these pieces will appeal to the design connoisseur. Inspiration begins with the hovering of a hummingbird stretching across to the setting of the sun and is brought to life by a skilled group of dedicated artisans. Nancy is proud to announce that after a productive and inspiring intergration of her creative passion together with the talent and experience of Latin American workers her sought after style is now available on a global scale. Indulge yourself and take time to enjoy this opportunity of truly unique home accents. Thank you for clicking on the catalog!